Liveaboard Diving with Seadoors in the Philippines. Seadoors is a dive boat with an experienced and friendly crew, that moves around the Philippines, specifically in the Visayas Region with richly diverse marine life and UNESCO recognised heritage site, Tubbataha reef. Many of the best dive sites in the Philippines are only accessible through a liveaboard. Seadoors is a 25 meter steel hull vessel with two 8m chase boats, which accommodates 14-16 guests with spacious, comfortable cabins. There are 6 Standard rooms and 2 Deluxe rooms - all equipped with remote controlled air conditioning units, charging outlets, plus own private bathroom with hot & cold shower, lavatory and mirror, with towels provided. Standard rooms have 1 queen size bed and 1 single bed and the 2 Deluxe rooms have 1 king size and 1 single bed. Each room can accommodate 2-3 persons depending on the customer's requirements. Room service is available everyday. In the saloon there is a comfortable living area with 2 L-shaped custom made Sofas, and an entertainment area with remote controlled air conditioning unit, charging outlets (for batteries, phones, cameras, laptops etc. ), a 42" flat screen TV, DVD player, and surround sound system. CDs, DVDs and books are also available. In the front is a covered lounge area with U-shaped Sofas and table. It's all very relaxing and a quiet place for just reading books and taking a well earned rest, breathing the fresh air, after diving. 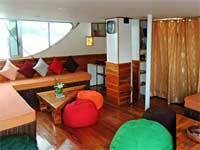 At the back area of the boat is an upstairs open space dining area with bar which gives an uninterrupted view of the breathtaking panorama of the Islands. It has a long custom made table and chairs that accommodate up to 16 guests, a refrigerator, water dispenser and sound system. The crew offers 5 meals a day, buffet style, with unlimited fresh brewed coffee and tea, and also serve fresh fruit shakes and juices after each dive. The boat's chief cook is proud to serve his delightful, mouth watering cuisine. Non alcoholic beverages are free of charge. Alcoholic drinks may be purchased from the bar. Above the dining area is a spacious sundeck, with beds, chairs and tables. This is a relaxing area that affords a full view of the beautiful breath-taking landscape of the region. The boat's diving deck is at the lower back area, where guests have their own shelves and cabinets for their gear, hangers for suits, 2 outside showers to freshen up after the dives, and two rinsing area with fresh water for the gear and equipment. 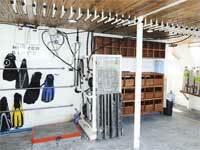 Diving tanks are filled with air and Nitrox (depending on the custome) before each dive. There is equipment available to rent for those guests who don't have their own. 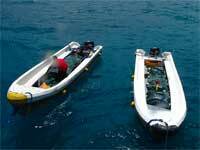 The crew also offers CMAS and PADI Courses. The scuba diving liveaboard cruises mainly explore distinct regions of the Philippines: the Tubbataha Reef Atoll, the Visayas, and the Sulu Sea, most cruises comprising 6 nights with 3 to 4 dives each day. Generally speaking the liveaboards centre on the Tubataha Reef in March, April, May, and June, and the Visayas in June, July, August, November, December, January, & February. Seadoors is equipped with all the safety emergency equipment needed and the crew is specially trained in all aspects of safety, including emergency and evacuation procedures.